The United Kingdom is in turbulent times. News reports invariably end with “the question that everyone is asking tonight”, because they too don't know the answer. Politicians jostle for position with unusual vigour, like pigeons on mouldy cake day. However, bothering to vote on contentious matters is better than the alternative, even if it rarely seems to make much difference. You know, like the annual services discount dance, switching largely meaningless brand names so that none of them can become complacent enough to exploit your understandable inertia. It could be worse, because neither side has sunk low enough to claim that supplies of tea would be interrupted. Should public infrastructure collapse, which would at least save that recurring hassle of switching gas and electricity suppliers, there is a tacit understanding of correct procedure to follow. If piles of corpses must burn in the streets, then it would be rude not to suspend a giant kettle above them. So, I am taking a considerable risk by revealing Digitiser: The Game: The Hot Drinks. You already need a PhD in Psychology to stay sane on the internet, but despite Stuart Ashen being embarrassingly lovely off-screen too, I'm still coming to terms with his distaste for tea. Even my own family: they tried to make me switch from decaf - I said, “no, no, no”. Though not so much the Tea Freelancer. If the clock does turn back to 1973, then the hot beverage situation would be much simpler. Tea, and no more than one jar of instant coffee for the rich, or foreign. Meanwhile, this household has two draws and one shelf full of stuff. That's ignoring the coffee capsule machine, which is probably more eco-friendly than buying another whole bag of grounds, only to throw most of them away after remembering how much work the cafetiere is. Of course, even nothing but tea is enough to brew tribal loyalties. The remainers, unwilling to extract the bag, insisting that no tea is better than weak tea. The leavers, who consider bags a terrible idea in the first place. Arguments continue as the punches fly at a milk first rally: one lump or two? Anyway, the clutter situation, bad at home, is worse in an office. 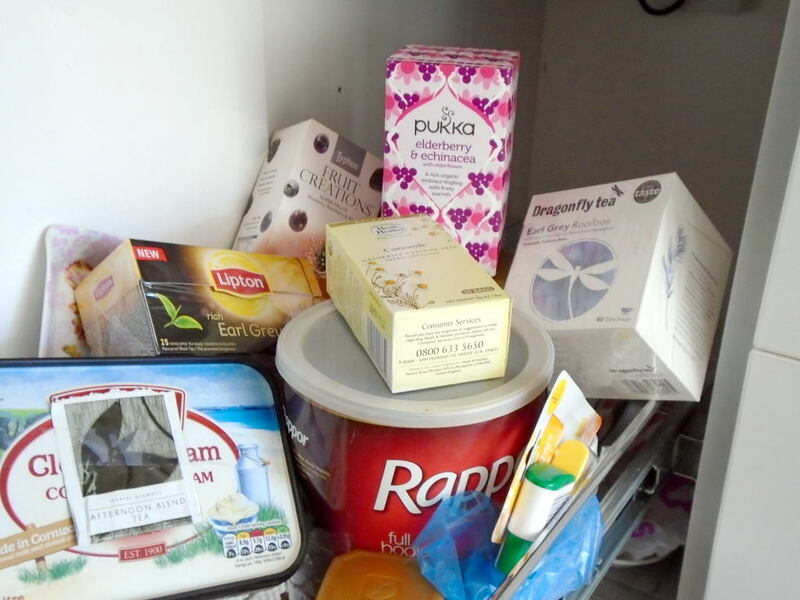 Office cupboards contain more neglected herbal teas, disparate individual sugar sachets, and without exception, the tub of powdered creamer. Nobody uses it, and nobody has dared risk throwing it out, even during the past two relocations. It will probably survive the fall of civilisation, and when excavated by future archaeologists, will still fail to resemble milk. Ironically, future archaeologists will conclude from their numerous finds of powdered creamer that it was extremely popular. They will proceed to buy tubs for their own offices, thus perpetuating the cycle. Brews it up and nothing fancier. Only the most popular drinks reside in the top draw. Except for the hot chocolate, which will be replaced eventually, unlike the plain cocoa powder, finally purged eight years after its expiry date. 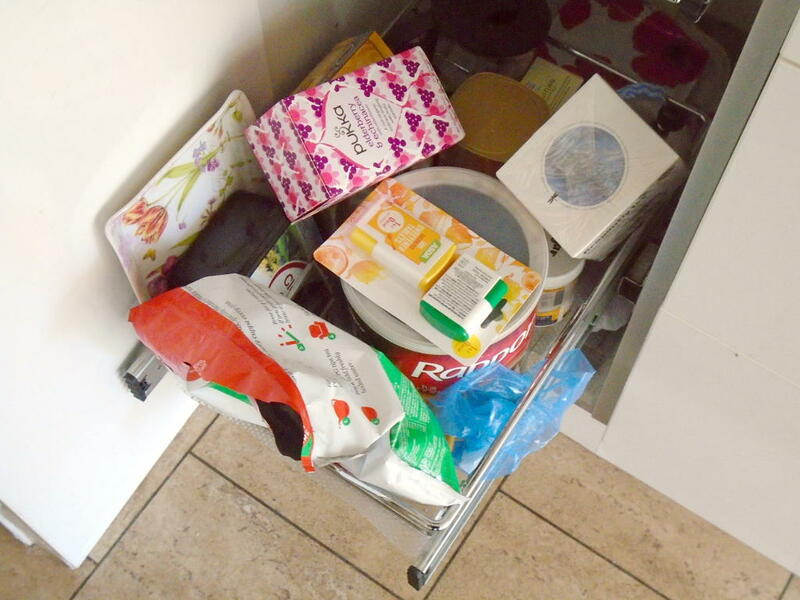 Also, the peppermint and liquorice infusions, which only ascended from bottom-draw purgatory in the hope that someone else might use them if they're visible. Please note, certain brand names have been obfuscated in my descriptions. The last thing that I want is to be mistaken for an influencer, then deluged with unsolicited free samples requiring a further forlorn storage draw. The Tatley redbush tea bags, also known as “funny tea” or “fish tea”, are mine. I like regular tea, but it also “keeps me going”, in another sense. Redbush is caffeine-free, and tastes close-but-different enough to be an acceptable substitute, rather than a poor imitation. At the risk of alerting those marketing types, here is a request for information about those jolly Tatley Tea Persons. I am convinced that they starred in a television advert that was the attic scene in Hellraiser, but in an office, and spilling tea rather than blood. I promise that readers who can collaborate my story will not find their personal details misused to dispose of my unwanted herbal tea bags. The glass coffee jar contains Cold Bland. From the poster child for uncaring multinationals, or perhaps just the first one in their field to get caught. Such matters cause far less division than the time that I bought supermarket value coffee granules, seventeen years ago. 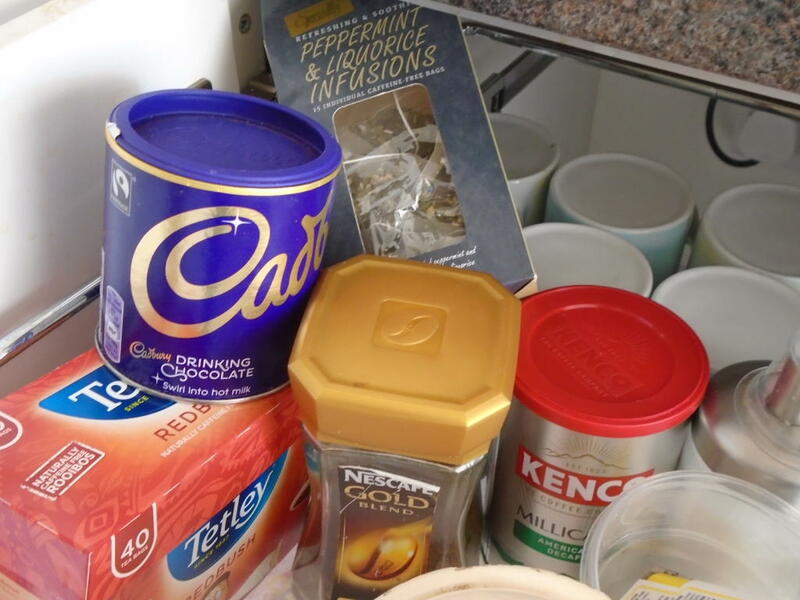 An occasional guest threatened to stop visiting until I threw them away, so, now you know exactly how to get rid of your '90s neighbour who keeps popping round for “coffee”. The coffee in a fancy tin, Kinco decaf, is mine. Despite appearances, it was the cheapest sensible option when I fancied a break from constant redbush. It tastes fine, though does leaves a slightly gritty dark residue, no matter how much I stir. Lurking at the bottom of frame is the chipped ceramic tea caddy. This is in constant use by those who still insist on asking me if I want a “proper tea”. 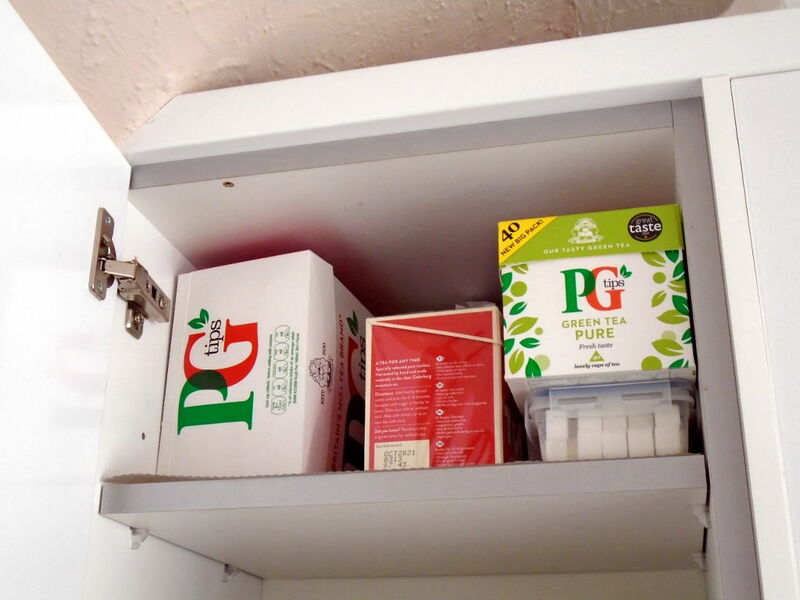 Above is the overflow cupboard, containing the massive box of GT Pips to be periodically decanted into the tea caddy. There is also enough hidden sugar behind the boxes to alert the authorities, who will be around shortly, if they can summon enough energy. The small red box is more redbush, whatever was cheapest that week. It's on the edge of being popular enough to merit supermarket own-brands, and I'll be first to switch. That statement should be enough to shoo any lingering marketers away. Finally, the green leafy box is a treat for fans of Mr. Biffo's Found Footage. This is the original green tea from the finale, where green tea seemed like the best single decaf option for minor catering. Each bag is infused with trace mineral elements, drawn from the rocks above the remarkably damp Drakelow Tunnels. They don't taste much worse, or better, for being previously cold-brewed, and will probably still be around for the sequel. Now to the lower draw. This used to be packed even tighter with herbal heartbreak, before the purge that also claimed the elderly cocoa powder. Boxes that promise a fruity taste sensation, like jelly sweets without the guilt, invariably deliver homeopathic squash. Other herbal teas rely on similarly flowery promises for their effect. Camomile is gently soothing, much like a cup of plain hot water. Elderberry and echinacea was my mistake, benefiting health only through the physical exertion required to extract the buried box. Earl grey redbush was not my idea. I tried vanilla redbush once, which smelt convincingly rich, but tasted like a minor incident at a distant ice cream factory. So, the regular earl grey will probably enter circulation first. In terms of taste, the breakfast blend is probably closest to regular tea, but that temporary storage tub isn't helping its chances. Skipping the sweeteners, which could fill another entry by themselves, there is a large tub of inoffensive instant coffee. This is a relic from a different minor catering event. It was good enough to serve, but apparently, not to drink from choice. Unless the alternative becomes supermarket value coffee, in which case, Famine probably rode past several weeks ago. Finally, there are some off-camera one-cup tea bags. At the risk of enraging hard-line Northern Tea advocates, cheap tea is, at worst, drinkable. 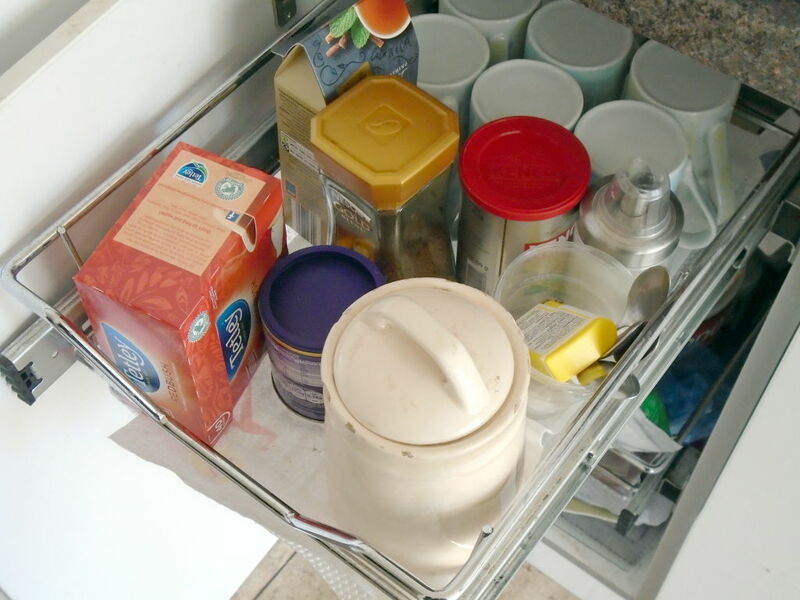 The majority of cupboard-users used to be fine with supermarket value bags, just strong enough for one serving, until the lone dissenter demanded branded one-cups. Poundplace obliged. There remain disagreements about water temperatures, and if brewing in a cup rather than pot affects the taste. I warned you that this would be controversial.